Total Pest Control have several years’ experience when carrying out a void property clearance. We have experience in property and garden clearances for houses, warehouses, pubs, offices, and shops. Our clients have included housing associations, landlords, facility management companies, and managing estates. We can offer a fully tailored quote to your circumstance. Removal of furniture, white goods, and rubbish. Dismantling of fixtures and fittings. Fast turnaround for change of ownership, or tenancy. 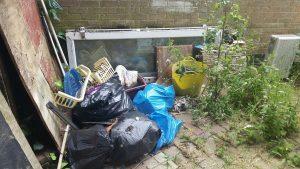 All waste removed during property clearances is disposed in accordance with current environmental legislation. We are a level two registered waste carrier and we leave with you a waste transfer note to fulfil all legal requirements.